Your Canton Ohio Cabin Rental Destination! Are you looking for a family-friendly getaway with horseback riding, ATV trails, fishing, and swimming? If so, you have come to the right place. 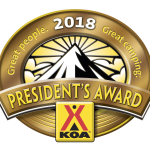 Whether you are native to Canton, Ohio and are looking to get away from your everyday activities or you are planning a trip to the area, look no further than Bear Creek Ranch KOA. For 44 years, Bear Creek Ranch KOA has been the destination for a countless number of happy campers. First-time campers and return visitors will all tell you that Bear Creek Ranch KOA is perfect for a weekend getaway, a relaxing family vacation, or some time away from your busy everyday life. No matter what the occasion is, you deserve some time away from your everyday routine. When this is the case, you will soon see why so many campers have chosen Bear Creek Ranch KOA and why we have continued providing our services for so many years. Next time you are searching for the perfect East Sparta cabin rentals or Canton, Ohio campgrounds, go with Bear Creek Ranch KOA. We thank you for visiting our website. Take a look through the rest of our site and get information on our cottages, RV sites, trails, horseback riding, day camps, fishing, and much more. With an abundance of activities and beautiful scenery, you will be happy you booked your camping trip. For information or to book your next trip, give us a call at 330-484-3901 or 1-800-562-3903 for reservations.